Two bioengineers are developing milk, minus the cow. Good for animal welfare and agricultural sustainability. But will lab-produced milk catch on? There’s something about pouring a tall glass of it to go with a warm, gooey cookie straight from the oven. As a kid, I remember watching this commercial and getting the “muh-muh-muh moo cows muh-muh-muh make milk” jingle stuck in my head. I was told that drinking a glass every day would make me grow big and strong. As an adult, I like to watch it swirl in my morning coffee. Like many foods that evoke memories, milk has a comforting quality to it. But there’s something else about milk, and that’s the ecological footprint it leaves behind. There is plenty of evidence documenting animal cruelty, and land and ecosystem destruction resulting from animal agriculture. Yet most people – even those who call themselves environmentalists – are reluctant to give up their favorite animal-derived foods for the good of the planet. Flavor and texture are powerfully persuasive, and most vegan substitutes just don’t cut it. With this in mind, two bioengineers have teamed up to develop a new kind of milk that removes cows from the equation. It’s called Muufri (moo-free – get it?) and it’s the brainchild of Tufts University alum Ryan Pandya and Stonybrook University grad student Perumal Gandhi. Unlike many types of milk derived from plants such as soy, almond, or coconut, Muufri is developed directly from cow DNA. Pandya and Gandhi have determined that only about 20 different components actually constitute milk, and they’ve begun assembling it from those twenty essential ingredients. They started by inserting DNA sequences from cattle directly into yeast cells, and then grew the cultures in a controlled environment. Think of the sourdough starter your grandmother “feeds” until she’s ready to bake bread; making Muufri is a lot like that. It’s also the same basic process we use to manufacture insulin or brew beer. While Muufri’s proteins come from yeast, its fats are derived from vegetable sources and tweaked to mimic the structure and flavor of fats found in real milk. Calcium, potassium, and sugars are added separately. The benefits of “building” milk in a lab? Besides omitting saturated fats, Pandya and Gandhi are trying out sugars other than lactose, which some 65% of humans have difficulty digesting. 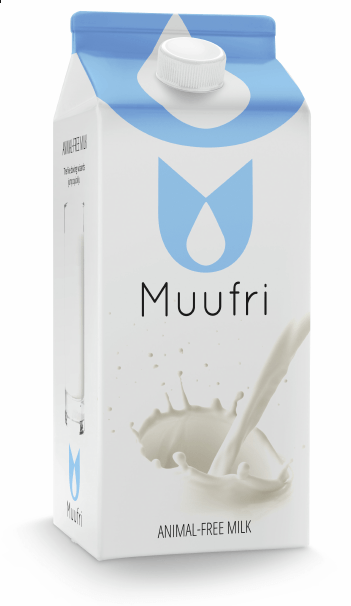 Muufri milk hopes to make up for areas where plant-based alternatives fall short. While the market is full of nondairy alternatives, they still lack the functionality of many dairy products – yogurt’s creaminess, for example, or cheese’s ability to melt and stretch. Because it is chemically identical to milk, the eventual goal is that products developed from Muufri will have the same functional and textural properties of real dairy products that nearly all vegan alternatives lack. While Pandya is confident that unsaturated fat molecules can be manipulated to resemble the fatty acids found in milk, that’s a project for the future. The main priority now, he says, is developing animal-free milk in liquid form. Does it sound like a frankenfood? Pandya told National Geographic last year that folks shouldn’t worry: “People who are anti-GMO who have legitimate concerns usually worry about supercrops taking over the natural world. We’ve essentially crippled the yeast, so if it does go out into the world, it’ll produce only milk proteins and die within hours.” Muufri comes on the heels of several other companies trying to develop meat, egg and dairy products without the use of animals, including Impossible Foods’ plant-based burger that “bleeds” the way a beef burger would. Pandya believes that their product represents the future of dairy. “If we want to fix an inefficient industry, we can’t replace [milk] with a similarly inefficient product.” Why rely on a whole cow – which requires enough food and resources to nourish horns, bones, muscle and more – when we can essentially reproduce the “udder” by itself? Pandya and Gandhi hope to be able to market Muufri by late 2017. The sooner the better; with global population projected to rise to 9 billion over the next 35 years, Muufri and products like it could be a viable strategy for producing food more efficiently while cutting back on the enormous resources that animal agriculture requires. Personally, I can’t wait to try it with my cup of morning coffee. Kathleen Nay is a mostly-vegan first-year AFE/UEP student. She hopes that someday products like Muufri will allow her to have her cheese, and eat it too.